I have been wanting to pop by and do an update for a few days now but I am unsure of what to say, truth is a lot has happened. Life is changing everyday and it’s all going a little too fast for me to record. I have gone from sitting in the same chair day in and out for years hardly going out to doing at least one thing a day, I still need rest days but even on those days I can still do a small task such make a drink or something. I am finding that I have pushed myself a bit far a couple for times as this is all new to me. I am having to take it slow but its still a faster pace than I am used to. 3 hospital trips, I managed to do a CT scan last week which I am still a little amazed by as I still can not lie down properly. It was definitely an amazing experience one I will probably share in more detail later. Gardening, I have been helping hubby in the garden mainly cuppa making duties but I have helped paint the poor neglected shed and have helped do a little digging. 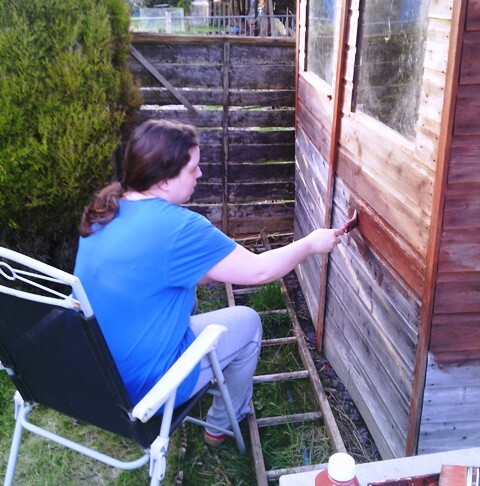 And yes that’s me painting a shed!! I am aware I look pretty rough (I haven’t looked well in a long time) but I don’t care because, yay, I am painting a shed!! Last week I painted our upstairs doors, that too I am still a little amazed by though I did need to rest lots afterwards and lots of rest in between. 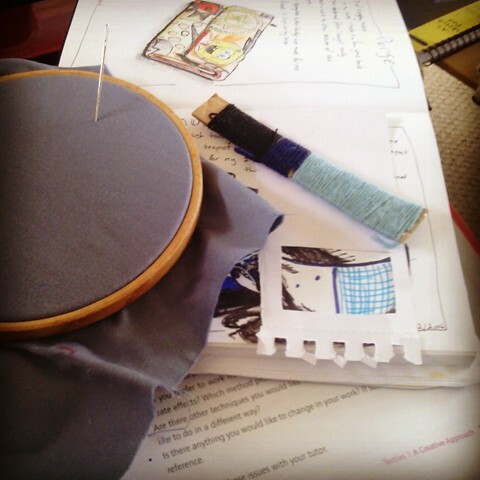 I am finding that I can get up and do things in little spurts then I sit for a bit then do some more. Which is so amazing. I have been in a few shops, this I am really excited about as I had gotten very afraid of going out as all the stimulation was too much but I have been in a few quiet shops and even bought my nephews a present myself for the first time since they were born! That was such a blessing. 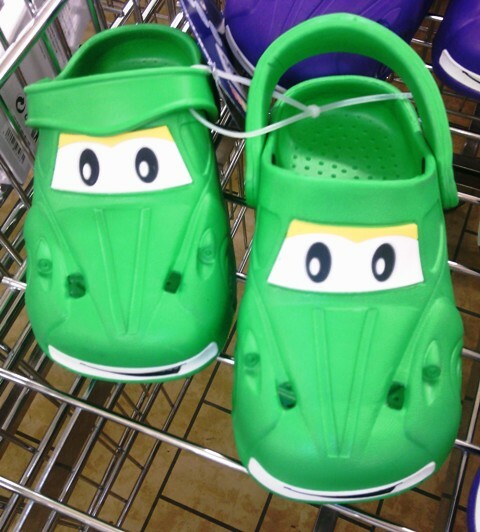 I bought them some car shoes. I have also managed to visit some family. Hubby has been taking taking me out to these places not quite there to go on my own just yet but I am feeling so more hopeful than I ever have that one day I will be able to get out and about properly on my own. 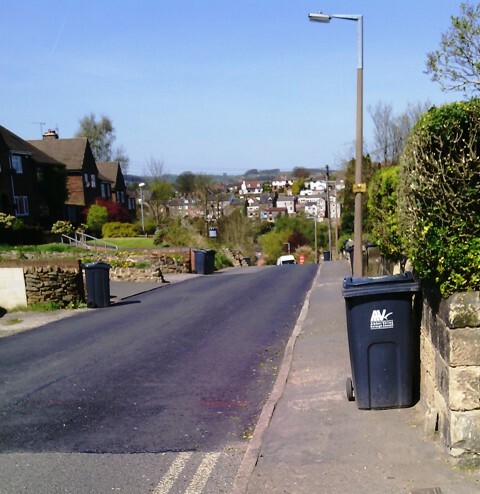 However I have been on a little walk out alone recently (today in fact, its so beautiful out there). 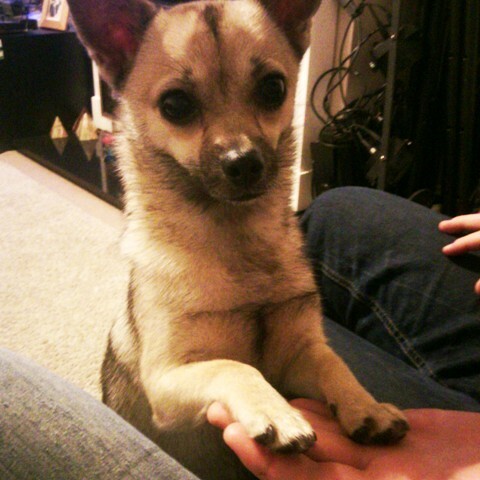 The picture above is of my sisters little Chihuahua who was very interested in the biscuit I was eating. Uni work, I have finished my first assignment for this module which was only 2 weeks late! Believe me compared to the last module that is a great improvement. I have a learning log/blog that I write here if anyone is interested in what I am doing. And of course I couldn’t do anything without Jesus, today for example I stood at the top of a hill I hadn’t walked down in many years, I felt dizzy looking down and started to panic, I breathed and reminded myself of what He has done for me so far, that He has always been there for me and I felt His presence next to me reassuring me that I would be ok so I fought the urge to turn back and guess what, I was ok. (I took the pic once I had calmed down a little) I know a lot of people would think this is all in my head, something I am used to being accused of throughout my illness also. I am ok with that because, like my illness (which is now being proved via tests) I know it’s not and I will continue to look to Him for help and support as I receive it when I do. As will anyone who asks with a heart that wishes to seek Him.